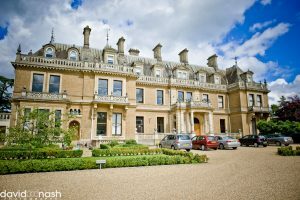 Over the years we have carried out four separate attacks of dry-rot restoration, to four separate apartments in this beautiful Mansion House, in Painshill Park, Cobham. All involved considerable work, including removing wall and sometimes ornate, ceiling plaster, replacing affected timbers, associated reconstruction work, timber and masonry treatment and re-plastering. Our latest contract followed a call from a very worried apartment owner who explained she had ‘mushrooms’ growing near her ceiling. We immediately arranged for one of our Property Care Association (PCA) qualified timber and damp surveyor to visit the property, carry out a survey and advise her on what the problem was and what was required to eradicate it. It immediately became obvious to us that there was a virulent attack of True Dry Rot fungus (Serpula lacrymans) to the upper area of the main living room, under the valley of the roof above. Small areas of plaster were removed and the exposed timbers were probed to determine the extent of the attack and what was required to eradicate and repair it. Following our survey, a detailed report was sent, together with images and our recommendations. On acceptance of our recommendations or experienced operatives attended the property and carefully removed areas of wall and ceiling plaster to expose the full extent of the attack. The upper timbers were fully supported and carefully cut out and taken away for safe disposal. The exposed masonry was prepared and treated with a fungicidal masonry solution, boring and irrigating as required. The timbers were then replaced as necessary, using new pre-treated timber and the walls and ceilings were replastered, strictly in accordance with our specification. A leaking roof valley was the cause of this attack and this was immediately repaired by the residence associations own contractor. Tapco HomeDry are experts at eradicating the dreaded Dry Rot fungus and have been doing so for over 46 years. Dry Rot is the most destructive problem you can have and will attack any property that is damp, both large and small. It should only ever be dealt with by a reputable specialist and compromise shouldn’t be considered, so call us first.